I was born and raised here in Wichita Falls. I graduated from Rider High School in 2003 and went right into the insurance business. I joined the Acceptance team in 2005 and became Managing Agent in 2008. Getting to know my customers and finding a plan to fit their needs is my favorite part of the job. I love being able to sit down with my customers and chat about what’s going on in life. Our office takes pride in the fact that we get to know all of our customers on a first name basis rather than just by their policy number. If I can make someone’s day by tailoring an insurance policy specifically for them and going the extra mile to make them happy, that’s what I want to do! 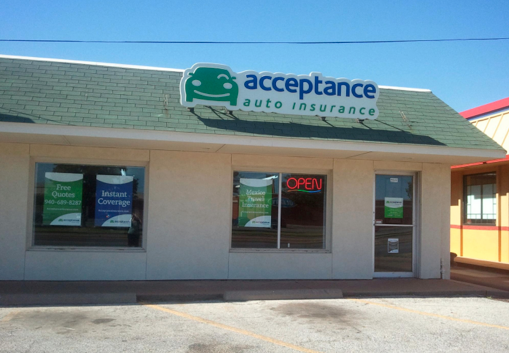 At Acceptance Insurance, located at 4022 Kemp Blvd in Wichita Falls, TX, we’re more than just auto insurance! Our multiple products help ensure you’re covered in all aspects of your life. In addition to auto, we can help you with your Motorcycle, Home, and Renters insurances, just to name a few. We partner with top rated carriers so you can compare and save before you buy. Combine your policies and you can save even more! You can find our expert agents in 350 neighborhood locations across the country offering fast, free quotes and the lowest possible rates. We handle claims quickly and we are dedicated to providing you with the very best service. Acceptance Insurance provides you with protection, options and peace of mind.